We turn ads into bags! Each one of our bags, made from recycled billboards, is funky and unique. We are passionate about creating jobs AND saving the planet. One billboard at a time! We are a multi award winning social business focused on sustainable job creation, via community based micro manufacturing franchise ownership, producing a quality product that is funky and unique, that also saves the environment! One billboard at a time! Our products are 100% handmade, durable and weather resistant. 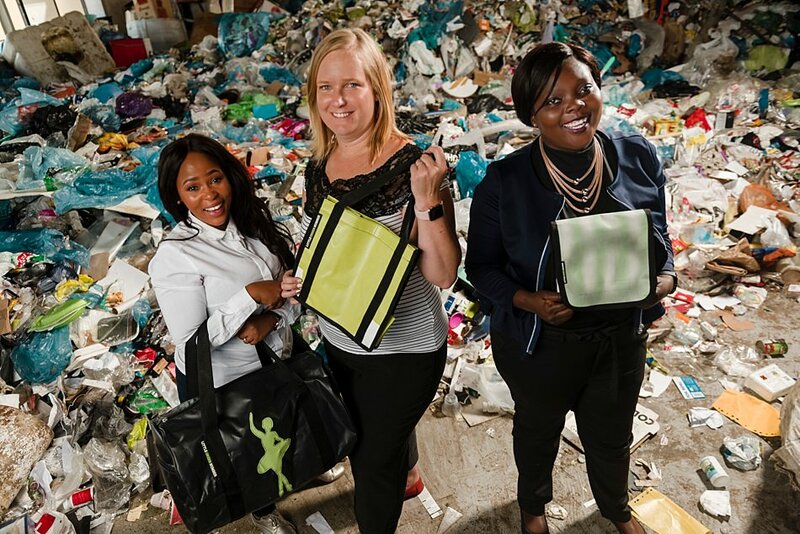 We are proud to be a South African business with an upcycled, innovative product that creates sustainable jobs. Our story begins in 2002: when Primedia and ABSA approached MES (a Christian social development organisation) with an exciting vision – to turn recycled billboards (which are PVC and non-biodegradable) into functional products… to literally go from waste to wow! MES initiated and ran the project as Tswelopele Recycling until 2010, when it was registered as a separate Not-for-Profit Company and renamed Waste2Wow. In 2011, To The Point Growth Specialists came across Waste2Wow and immediately spotted the opportunity in assisting us to become a self–sustainable business that could embody the principles of social business i.e. combining doing good with doing good business. To The Point assumed responsibility for capital costs and liabilities and soon after registered Little Green Number as the Private company to replace Waste2Wow. Little Green Number creates the market for and sells the products and by so doing creates jobs, alleviates poverty and saves the planet. We aim to be a profitable commercial brand that is sustainable and at the same time empower individuals to create their own businesses, so that they will become responsible, sustainable, active citizens of South Africa. Our Buy 1 Give 1 philosophy means that for every Little Green Number bag we sell, we donate a Little Green Number to a school child that needs it. enhancing both financial and operational capacity of black people to establish small and medium size enterprises to address poverty. We aim to support black women as a priority. This also makes us an ideal organisation for preferential procurement in order to improve your BEE compliance. Little Green Number is a level 2 BBBEE contributor. Little Green Number is a registered exporter and we hope to connect with different retailers around the world to support us in our dream to create jobs and save the planet, one billboard at a time!